Petit Ours price per day from CHF 145 Situated on the slopes above Villars-sur-Ollon, Petit Ours features a ski-in and ski-out option. It is surrounded by a large garden, and offers an apartment with a fireplace and cable TV as well as a private terrace with barbecue facilities. The kitchen is well equipped and includes modern facilities such as a dishwasher, a microwave and a Nespresso coffee machine.. Apartment Emeraude II Villars-sur-Ollon Located on the outskirts of Villars-sur-Ollon, in the district of Rochegrise and 400 metres from ski lift, Emeraude 26 offers a fully furnished studio and a garden. The studio includes a kitchenette, a seating area with a TV, a private bathroom and a balcony. The Roche Grise Train Station is 200 metres away and an indoor swimming pool is 1. BnB Les Choucas price per day from CHF 250 BnB Les Choucas in Villars offers you a studio with a fully equipped kitchenette and a large, south-facing balcony as well as free Wi-Fi and free parking on site. It is located only a 7-minute walk from the Villars train station. There is also a nice pavilion for your private use in the garden of the BnB Les Choucas.. 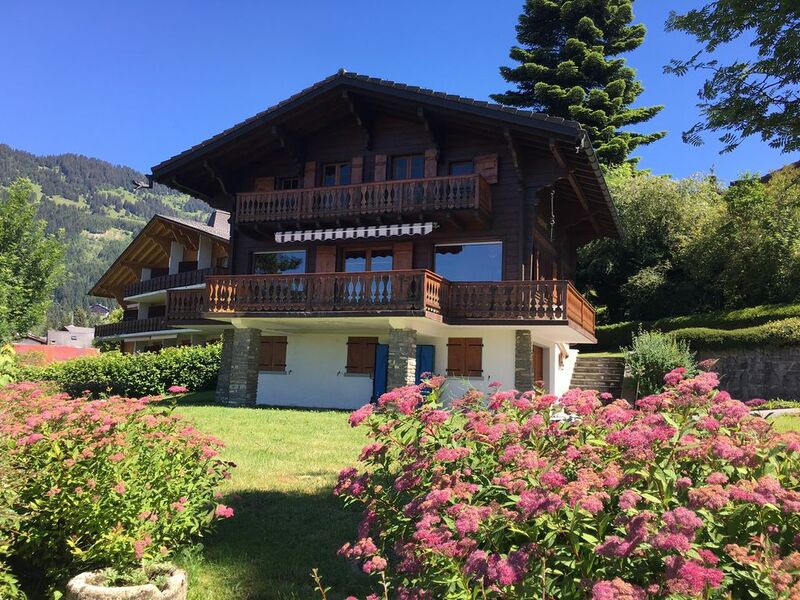 Le P'ti Tzi-Mé price per day from CHF 206 Situated at the foot of the Bretaye ski area in Villars-sur-Ollon, this charming wooden chalet offers breathtaking views over the Rhone Valley and surrounding Alps. The chalet at Le P'ti Tzi-Mé has free Wi-Fi access, wood-panelled walls and ceilings, a kitchen and a living area with an open fireplace on the ground floor. Chalet RoyAlp Hôtel & Spa price per day from € 237 The 5-star Chalet RoyAlp Hôtel & Spa offers direct access to the ski slopes in winter and to the Villars Golf Club in summer. An indoor swimming pool with open fireplace, a hot tub, a sauna, a steam room, a fitness centre and relaxation area invite you to relax. Hôtel Du Golf and Spa price per day from € 101 Hôtel du Golf and Spa is located in the centre of Villars-sur-Ollon, only 100 metres away from the train station. The new 300 m² spa area facing the Dents du Midi features indoor and outdoor hot tubs, a sauna, a Turkish bath, and fitness facilities. 2 à la carte restaurants serve Swiss cuisine, including raclette and fondue. Alpe Fleurie Hôtel & Résidence price per day from CHF 125 . Ecureuil price per day from CHF 180 . 9. Take exit 17-Aigle toward Les Mosses/Ollon. 10. Merge onto Route 11. 11. Turn right onto Route de Transit/Route 9. Continue to follow Route 9. 12. At the roundabout, take the 3rd exit onto Route d'Aigle. 13. Turn right onto Pl. Hôtel de Ville. 14. Continue onto Route de Villars. 15. Continue onto Glutières A. 17. Turn left to stay on Auliens. 18. Continue onto Route de Villars. 19. Continue onto Av. Centrale. 20. Sharp left to stay on Av. Centrale. 21. Continue onto Route des Hôtels. Ski resort Adelboden-Lenk, recommended ski resort for beginners. 40 km from town of Villars-sur-ollon. Ski resort Adelboden, number of cross country pistes: 86km. 44 km from town of Villars-sur-ollon. Ski resort Aeschi, number of ski pistes: 8. 63 km from town of Villars-sur-ollon.